Armand Schwerner — poem — letter to Paul Blackburn . . .
Poetry Criticism: What Is It For? (March 15th, 2000, New York City) — moderated by poet Susan Wheeler, the panel engaged critics Stephen Burt, Marjorie Perloff, Michael Scharf and Helen Vendler in a provocative discussion of poetry criticism today. Burt’s and Scharf’s papers were published in Jacket 11; the others are published here, with some audience discussion. Paul Quinn on Language poetry — " . . .puns and jokes . . . appropriate for a poet who . . . boasts of working under the influence of the three Marxes — Chico, Groucho and Karl — and the four Williamses — Raymond, William Carlos, Tennessee and Esther." Nate Dorward on three books about Roy Fisher — Interviews through Time and Selected Prose, Roy Fisher. News for the Ear: A Homage to Roy Fisher. Ed. Peter Robinson and Robert Sheppard, and The Thing about Roy Fisher: Critical Studies Ed. John Kerrigan and Peter Robinson. Cassandra Pybus — The CIA as Culture Vultures — on the funding of Quadrant magazine — "Josselson was not happy with the make-up of the Australian committee since the CIA strategy was to court intellectuals of the non-communist left, not fund a bunch of zealous anti-communists. . . . Krygier chose James McAuley as editor. 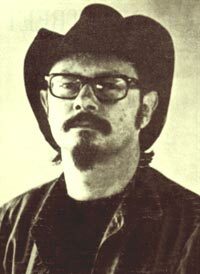 He was not an obvious choice for editor of a literary journal, since he was viewed by many in the literary world as a mediocre poet and a Catholic fanatic. This chorus of concern did not bother Krygier. He had no interest in poetry or religion: it was McAuley’s passionate anti-communism which really impressed him." an interview with Steven Ford Brown, in Jacket 18. 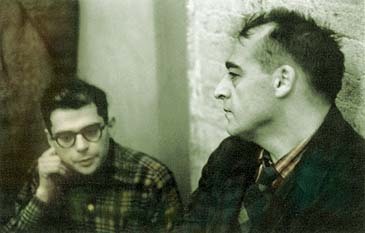 Allen Ginsberg and Kenneth Patchen backstage at the Living Theatre where Patchen was performing with Charlie Mingus, New York City 1959. Photo copyright © Harry Redl 1959, 2000. 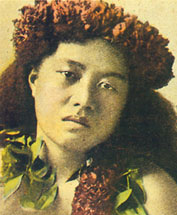 — Hawai’i: Becoming Miss Universe? — Jaqueline Goddard, January 1995. Jacqueline Goddard (b.1911) an icon of bohemian femininity, was part of the Paris artistic scene between the wars, and was photographed by Man Ray in Paris in 1930. The telephone lady above is not Ms Goddard.